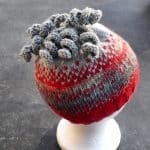 I’m pretty useless at making a good pompom for a hat, so I’m knitting curlicues instead. 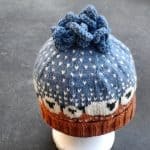 A bunch of knitted curlicues can look pretty good on the top of a woolly hat. 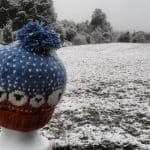 The decision was made when I photographed my version of the Ba-able Hat on a snowy morning. I thought the pompom looked a bit pathetic. The trouble is that I just don’t seem to be able to tie a strand tight enough to hold the whole thing together, and it very soon falls apart. So here is how to make them: Using suitable yarn and needles for your project, cast on 20 stitches (cable cast on). First Row: Knit into the back and front of every stitch. Next Row: Purl all 40 stitches. Next Row: Cast off loosely. If your cast off is inclined to be tight, use a bigger needle. As you cast off, observe the curlicue curling. Then thread the two ends through the top of the hat and tie them off. I added about 8 curlicues to the top of the two hats pictured. Thank you for this great information! I love my curlicues!